This was actually among the most interesting findings from the fabulous book, Nurtureshock— which by now is probably the most-mentioned book on this blog. Somehow, in all my Nurtureshock mentions, I never discussed the basic findings about self esteem (basically, what you read above). I’m convinced that my parents always telling me how smart I was did me no favors (not that I blame them or anything, and hey, I do have great self esteem). But I did decide that if something was hard I probably just was not very good at it and I would focus my efforts elsewhere. After reading Nurtureshock, I do try and praise the boys for hard work and persistence, rather than innate intelligence. Anyway, good to see that schools are catching on. Oh, and really, you should read Nurtureshock. What has happened is that we’ve seen what’s basically a historically unique sustained decline in the quantity of people employed by state and local government. The fact that Barack Obama has been president during this time tends to somewhat confuse people’s analysis, but we basically just ran a year-long experiment in the idea that curtailing the public sector would supercharge private sector growth and it’s a bit hard to see the supercharging in the data. It has always amused me how much many little kids seem to care about the animals mascots of the Democratic and Republican parties. I get the sense that elementary school teachers may way over-emphasize this aspect to get kids interested in politics. I don’t think it actually does much good. 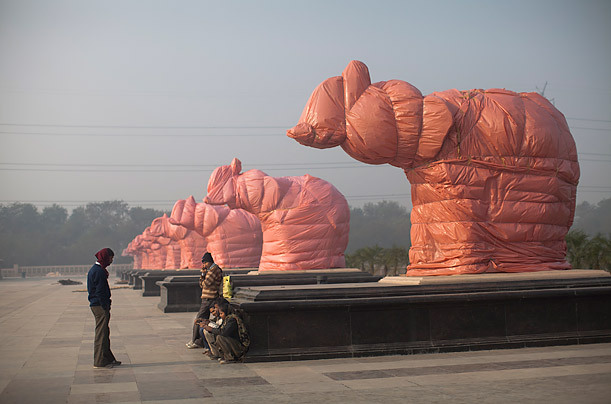 Anyway, apparently in India that government has ruled that a number of elephant statues are too closely tied to a single political party and therefore must be covered up before the impending election. This leads to a rather intriguing Time magazine photo essay. My favorite below. So here is the problem that Romney confronts. 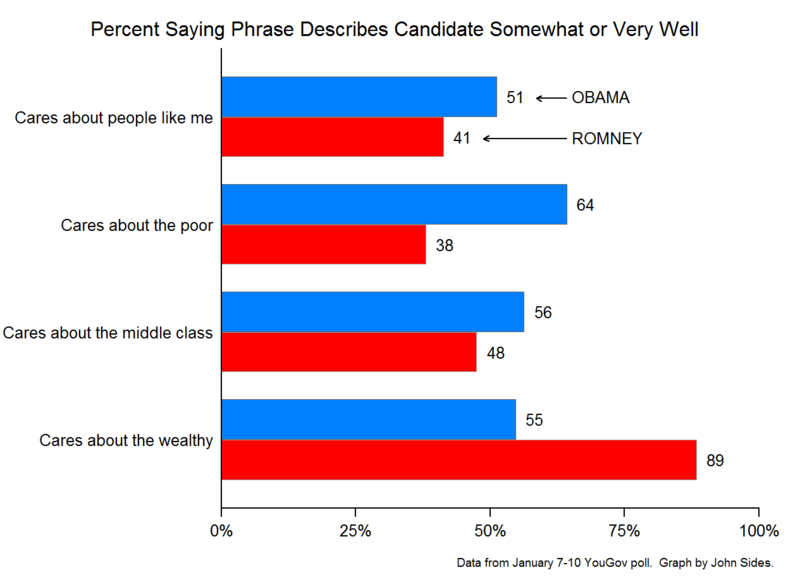 Americans perceive him as personally wealthy more than they do Obama. They perceive him as caring more about the wealthy, but less about “people like me” and the middle class, than does Obama. Moreover, Obama can “get away with” being perceived as personally wealthy or caring about the wealthy in ways that Romney cannot. For Americans, Romney’s personal wealth is more intimately tied to the perception that he cares about the wealthy—and this in turn implies that he cares less for the middle class. I give “the American people” and public opinion in general a hard time a lot here. I’ve got to say, though, I think they’ve got Romney pretty much dead to rights on this. Given Romney’s numerous plutocratic turns of phrase about “envy” and such as well as his lived experiences, it seems pretty safe to me that this is a man who neither understands, not particularly cares about, average Americans all that much. Of course, if the economy does not continue on it’s improvement, that won’t stop him from being president.